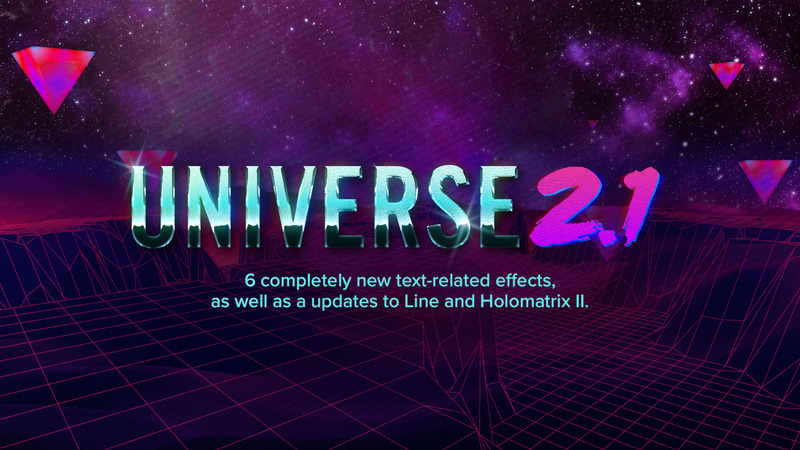 Red Giant Universe 2.1 has just been released! This latest free update provides enhancements to exisiting effects and even adds some new ones. Watch this video to see what's new or read the changes below. AV Club – Mimic the lo-fi, noisy text you find on ancient video tapes, old infomercials and local access cable channel shows. Luster – Give your text a slick 1980’s retro look. Luster applies a metal sheen to text, and includes a refraction-based bevel for a glassy simulated 3D look. Title Motion – Create text and shapes and then instantly add dynamic animations that bring them on and off screen. Great for titles, lower thirds, callouts and more. Ecto – Create haunting, evolving titles with this glowing fractal-based effect, inspired by Ghostbusters and Stranger Things. Long Shadow – Apply a colored, long shadow to text, logo or shape, for both classic and modern motion design. Glo Fi II – Give text an ethereal moody look by instantly adding silky smooth, self-animating, fractal-based glow effects to titles. A simple UI make it easy to apply evolving, organic glows. Line – This update adds the ability to add text at the start and endpoint of a line. Holomatrix II – This update includes blurred, chromatic distortions, a new strobe effect and much more. If you are already a Universe user, you can download the latest version of Red Giant Link and update to Universe 2.1 in Link’s Universe panel. If you do not yet own Universe 2.1 you can purchase annual volume licenses (minimum of 5) right here at AV3!